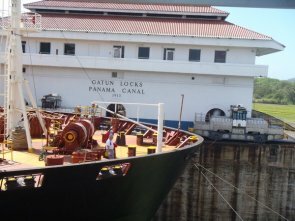 The Panama canal locks are an amazing feat of engineering. They have been running continually for over 100 years. The technology is almost the same now as it was 100 years ago. "Mules" (small electric trains) have lines to the bow and stern to hold the boat in the middle of the lock while it moves through. They are not always entirely successful. While we were watching there was a cloud of concrete dust as as a container ship brushed against the side of the lock. 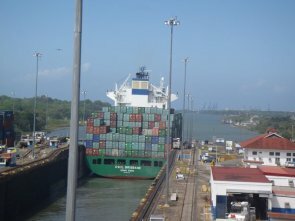 These ships pay between $300,000 and $500,000 for a transit and get their sides scraped in the process. The process is a bit different for small boats. We have to form a "raft" of three boats abreast as we approach the lock entrance (which will be a fun piece of maneuvering and docking). Anastasia, being a catamaran, is the center boat of a raft and the monohulls on each side of us will have tyres strapped to their sides for protection. We do not use the mules, instead lines are thrown down from the sides of the lock, which hold us in place while the locks fill and then we move through under our own steam with lock workers moving the lines from one lock to the next.